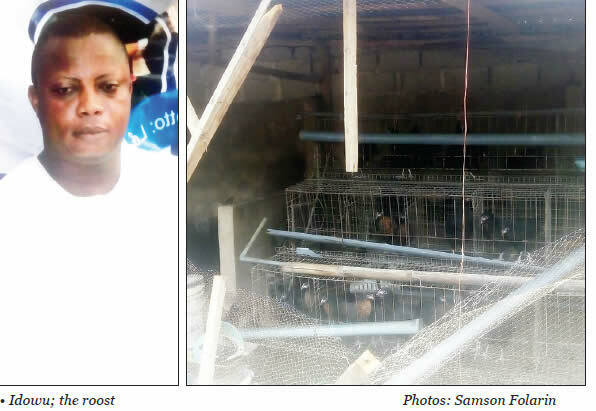 A chicken roost built by a Lagos resident, Segun Irein, has landed his family into trouble. PUNCH Metro reports that Idowu, a chartered accountant, whose house backed the roost, had complained to the couple that he was being disturbed by the chickens. Instead, the Ireins allegedly attacked him. The victim was later taken to a hospital by residents but he died shortly after. old was responsible for the welfare of his wife and four children. Punch visited the community on Thursday and met a crowd of residents and landlords discussing the death. “Idowu had complained several times about the smell of the pigs. It took nine months and the intervention of the landlord association before he stopped rearing the pigs.“After that matter was resolved, there was peace in the community and in December 2016, when the suspect’s wife had a party, the deceased attended.”The deceased elder sister, who did not want to be identified, said Idowu had taken one of his children to school on Monday when he saw some chickens being fed in the roost at Segun’s house. “He went to the house and knocked at the door repeatedly, but nobody answered him. He banged harder and the man’s wife, Sola, came out and asked him what he wanted from them again.“Idowu insisted on speaking to her husband. The man came out and they started exchanging words.“Because the doorstep was elevated above the ground where Idowu stood, it was easier for Segun to grab Idowu by the neck.“In the ensuing scuffle, they both fell down. The wife picked a stone and hit Idowu in different parts of the body.”PUNCH Metro learnt that a passerby, who saw the incident, raised the alarm as residents rushed to the scene to separate them. The victim, who was drenched in blood, drove himself to the Igbogbo Police Division where he reported the attack. He was reportedly issued a letter to go to a hospital for treatment. “But he later disappeared through the back door. “His wife, however, assured us that he also went to report at the Igbogbo division,” a landlord, who did not identify himself, said.PUNCH Metro gathered that Idowu was treated and given some drugs for the injuries he sustained in the eyes. He was reportedly called by some residents, who appealed to him to drop the case against the couple. He allegedly left the hospital for the police station, where he wrote a statement to withdraw the case. However, shortly after he got home, he allegedly slumped and died. “He was screaming, ‘ I hope I am not about to die’. This was around 8pm. He then collapsed. We put him in his Toyota Corolla and drove him to a private clinic in the community, where the doctor confirmed him dead.“We took the corpse to the police station and the couple were arrested. We suspect that he was stabbed with a poisoned sharp object during the fight,” another resident said.The victim’s wife, Modupe Solaja, who said they had been married for over 20 years, called for justice. Modupe said she had yet to inform their first child who was an undergraduate at the Adeleke University in Osun State. “My husband was planning to pay her school fees of about N1.2m this weekend. I am a full time housewife. How will I cope with the school fees of four children? Don’t let me suffer for nothing,” she said.The state Police Public Relations Officer, SP Dolapo Badmos, confirmed the incident, adding that the case had been transferred to the State Criminal Investigation and Intelligence Department, Yaba.